A team led by UOIT’s Brad Easton is looking into ways to make roadside breathalyzers more durable and reliable. Recently, a Brampton judge noted in a ruling that many of the devices in Ontario have no way to account for the uncertainty of their measurements, making them unreliable. When breathalyzer devices are not functioning properly or maintained in working order, there can be serious blowback, especially when a few millilitres of alcohol can spell the difference between being able to drive home and a criminal conviction. The unreliability of these devices was recently on full display in a Brampton courtroom when a judge, siding with a former government scientist, threw out charges against a man who failed a roadside breath test, after the scientist detailed how these devices are unreliable and the processes used in Ontario are generally flawed. 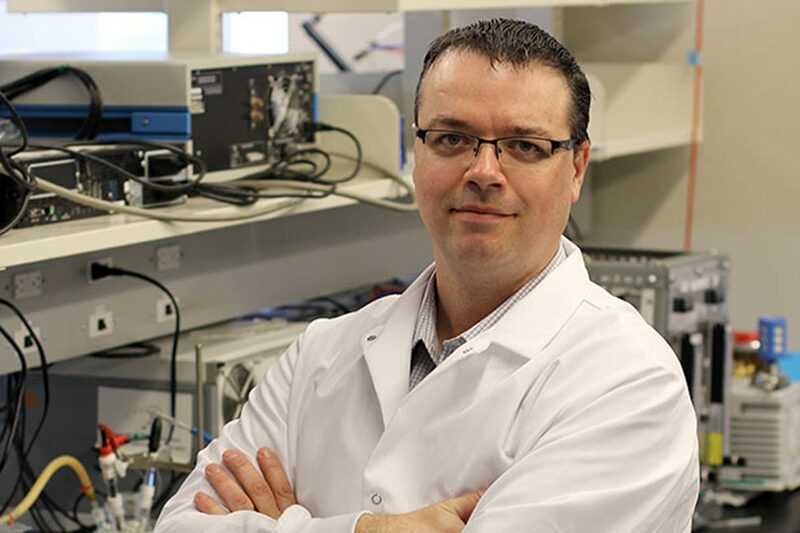 With only a few millilitres of alcohol representing the difference between a criminal conviction or acquital, Brad Easton, a professor with the University of Ontario Institute of Technology, is looking to improve not only the reliability of these devices, but their costs as well. Focused on the roadside devices specifically, these breathalyzers rely on fuel cells for the eletrochemical reaction to determine the amount of alcohol in a person’s system, Easton is working to improve the durability of these sensors, along with their consistency. “That’s really the important thing. If somebody blows a 90 tomorrow and the same person shows up in the same state, you want them to blow a 90 and not a 70,” says Easton, an associate professor in UOIT’s Faculty of Science. This consistency was a major stopping point in the Brampton ruling, which cited an “uncertainly of measurement,” pointing to the fact that many Ontario devices do not have a way to account for the uncertainty of their measurements, which destroys the credibility and potential accuracy of any readings. Now, Easton is “torture-testing” devices through different weather conditions to determine how they impact the device readings and what can be done to improve and limit the impacts – something that has never been done before. “Over time, if contaminants get on it or if there are changes in the structure of it, the signal that comes out of the device becomes lower,” Easton explains. The fuel cells in breathalyzer devices rely on platinum – a very expensive metal – as their catalyst, which initiates the chemical reaction to get a reading. Easton and his team of students are now testing other alloys, such as combinations of platinum and copper or platinum and manganese. The team has been able to reduce the amount of platinum used by about 95 per cent, with great success in their results. “(We) still get very good sensing with them,” Easton says. The results of their research to date were recently published in the journal Sensors and Accutators B: Chemical and the team continues to work on improving the durability of these devices. How do I get on the Sunshine List?